Treat 《World Tournament》 in all areas as if they had no specified cost. 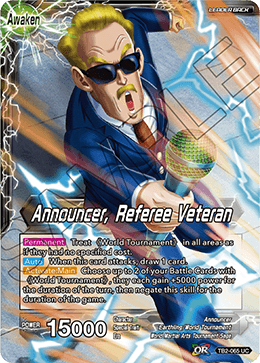 You cannot include non-《World Tournament》Battle Cards in your deck. When you play a 《World Tournament》 Battle Card, draw 1 card. 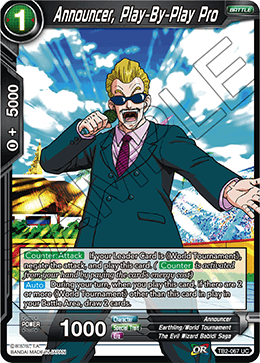 Choose up to 2 of your Battle Cards with 《World Tournament》, they each gain +5000 power for the duration of the turn, then negate this skill for the duration of the game. 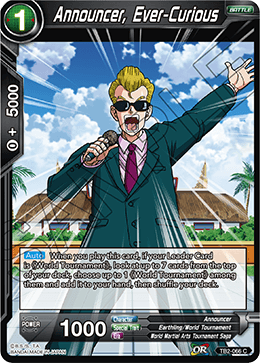 When you play this card, if your Leader Card is 《World Tournament》, look at up to 7 cards from the top of your deck, choose up to 1 《World Tournament》 among them and add it to your hand, then shuffle your deck. 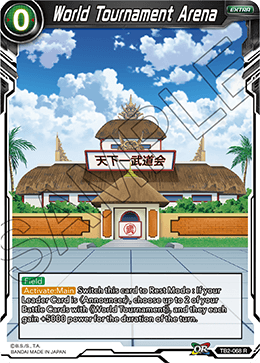 During your turn, when you play this card, if there are 2 or more 《World Tournament》 other than this card in play in your Battle Area, draw 2 cards. 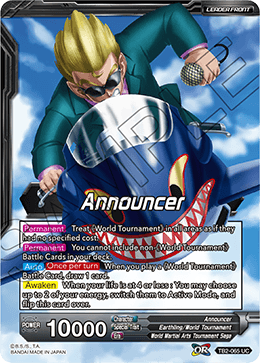 Switch this card to Rest Mode : If your Leader Card is 〈Announcer〉, choose up to 2 of your Battle Cards with 《World Tournament》, and they each gain +5000 power for the duration of the turn.